Protein-protein interactions have decisive roles in almost all aspects of the structural and functional organization of cells. But in spite of the increasing amount of complete genome sequence data, the ability to predict protein function from sequences alone is limited. Therefore comprehensive analysis of protein-protein interactions, as derived from the yeast two-hybrid mating system, will yield valuable information for functional biology on a proteomic scale. We have developed an optimized interaction mating protocol for the yeast two-hybrid system, which gives increased mating efficiencies. This significantly reduces the effort and cost of cDNA library screening and allows multiple parallel approaches. Improved preincubation conditions before mating, and optimal cell densities and cell ratios enable almost quantitative mating of the yeast cells carrying the cDNA library. We have proved the applicability of this technology using 20 bait proteins to screen an Arabidopsis thaliana cDNA library, in spite of bait-dependent variations in mating efficiency. The improved yeast two-hybrid interaction-mating protocol presented here allows the multiple parallel screening of cDNA libraries. It can be carried out without specialized equipment and has the potential to be standardized and automated. In the past few years, genome projects have produced an overwhelming amount of sequence data; however, reliable functional predictions for the encoded proteins are limited to those genes with clear homologs in the databases. As this is the case for only about half of the predicted open reading frames (ORFs), even in the genomes of Escherichia coli or Saccharomyces cerevisiae, there is an increasing need to develop broadly applicable technologies to assign functions to the encoded proteins. Apart from the systematic phenotypic characterization of knockout mutants, only a few ways of determining the function of a protein are accessible using multi-parallel or large-scale analytical techniques. Steady-state levels of transcripts, for example, can be assessed on a whole-genome basis by expression profiling, protein levels and post-translational modifications can be quantified by two-dimensional PAGE in combination with mass spectrographic techniques (MALDI-TOF) and the multi-parallel analysis of metabolite accumulation can be determined by metabolic profiling [1,2,3]. As proteins function exclusively by means of interaction with other molecules, a particularly important characteristic of a protein is the transient or stable formation of protein complexes. The systematic and comprehensive analysis of protein-protein interactions will provide valuable information for understanding protein functions. Of all the different genetic procedures for investigating protein interactions, the yeast two-hybrid system [4,5] is currently the only one that is well-established enough to be suitable for genome-wide screenings [6,7]. In this system a 'bait' protein is expressed as a fusion to the Gal4 DNA-binding domain and is coexpressed in yeast with a library of cDNA fused to the activation domain of Gal4 (the 'prey'). Alternatively, the DNA-binding moiety of the 'bait' protein can originate from the E. coli LexA repressor protein [8,9]. A productive interaction between the bait fusion protein and an interacting partner protein results in expression of a reporter gene. This method has been used in two large-scale projects to systematically examine interactions in all possible combinations between the approximately 6,000 proteins encoded by the S. cerevisiae genome [10,11]. The resulting large interaction networks provide information not only about possible protein complexes, signaling chains or metabolic pathways, suggesting functions for yet unannotated proteins [12,13], but can also be used for evolutionary studies and for identifying essential genes . However, the fact that only a small number of interactions were found consistently in both projects shows that the experimental set-up has not been saturating . These projects depended on the fact that all predicted ORFs of the yeast genome were directly available for PCR amplification and cloning and could be used as full-length constructs. For higher eukaryotes, the cloning of a complete 'ORFeome' is even more complicated. ORFeome projects in connection with large-scale two-hybrid approaches have recently been started [16,17]. However, at present the proteome-wide systematic analysis of all proteins of eukaryotic model organisms such as Arabidopsis thaliana is not possible. Therefore the use of genomic or cDNA libraries to screen for interacting partners of a protein is mandatory. Additionally, because of the inclusion of truncated proteins, the library approach may offer the possibility of directly assessing interacting protein domains [18,19]. Screening a cDNA library with the yeast two-hybrid system is laborious and time consuming. For large-scale and multi-parallel screenings, current protocols are limited, and approaches using arrays and automated systems are expensive and not affordable for most laboratories. Here we present an improved interaction-mating screening protocol with a significantly increased efficiency. The total cell numbers needed to obtain sufficient double transformants to ensure complete coverage of the library is reduced, and effort and cost are minimized. Screening a cDNA library for interacting partners using the yeast two-hybrid system requires investigation of a sufficient number of doubly transformed cells, a number dependent on the complexity of the cDNA library. As a rule of thumb, it is sensible to obtain at least five times more doubly transformed yeast cells than the total number of independent clones in the cDNA library being screened [20,21]. The total number of yeast cells used is the main factor determining the culture volumes, agar plates and hands-on time required. Therefore, an efficient method of obtaining doubly-transformed cells is particularly important. In the experiments reported here we compared different methods and developed an improved mating procedure suitable for large-scale yeast two-hybrid screening. We aimed at the development of a standardizable protocol for obtaining a minimum of 5 × 106 double transformants, a number sufficient to cover the complexity of most cDNA libraries. Yeast strain PJ69-4A propagating plasmid pTS195.1 was successively transformed with different amounts of vector pCL1 using a standard transformation procedure . 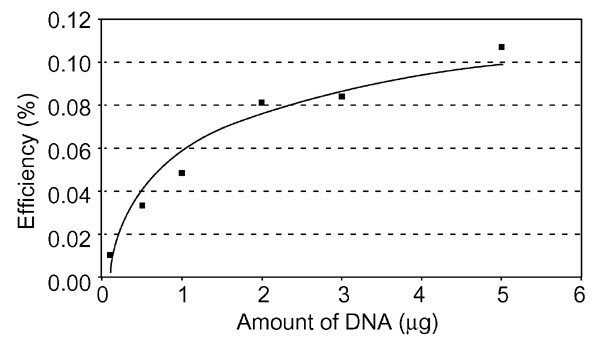 Transformation efficiencies ranged between 0.01% (0.1 μg DNA per 108 cells) and 0.1% (5 μg DNA per 108 cells, Figure 1). Extrapolation of the data revealed saturation at approximately 0.11%. Successive transformation of yeast strain PJ69-4A. Yeast strain PJ69-4A was transformed with vector pTS195.1, raised in liquid selective medium lacking uracil (SD-U) and then successively transformed with plasmid pCL1. Numbers of doubly transformed cells were monitored by propagating aliquots on selective medium lacking leucine and uracil (SD-LU) and efficiency in terms of doubly transformed cells versus all cells was calculated. As a standard mating protocol we used a method from , suitable for yeast two-hybrid library screenings, a further development of the original interaction-mating procedure described in . Mating of two haploid yeast strains of opposite mating type, each harboring one of the respective plasmids, results in the formation of doubly transformed diploid zygotes. A major advantage of this approach is the possibility of using frozen aliquots of yeast cells carrying the cDNA library; hence transformation of the whole library in every single screening experiment becomes unnecessary. Yeast strain YTS1 (MATα) was transformed with plasmid pCL1, propagated overnight in liquid medium and frozen in aliquots. A melted aliquot of YTS1/pCL1 was combined with a freshly raised culture of PJ69-4A/pTS195.1 (MAT a) and then subjected to the standard mating procedure. Because the main focus of our experiments was reduction of the total cell number in our assays, we calculated mating efficiencies as the ratio of zygotes versus total cell number (viable and nonviable MATα cells from the frozen culture plus MAT a cells). The mating efficiency of the standard method was found to be 2.8% on average. In terms of the usual way of quantifying mating (the ratio of zygotes versus viable MATα cells) this corresponds to a value of 12.2% in accordance with values of around 10% reported in the literature [23,25,26]. To enable short-term quantification of mating efficiencies we set up a model system using green fluorescent protein (GFP) as a reporter. Expression of the yeast-enhanced green fluorescent protein (yEGFP ) from plasmid pTS195.1 was controlled by the Gal1 promoter and was therefore dependent on the coexpression of the Gal4 protein from plasmid pCL1. Using the yeast strains YTS1 (MATα) and PJ69-4A (MAT a), transformed with pCL1 and pTS195.1, respectively, and the standard mating procedure for producing doubly transformed zygotes, GFP fluorescence was detectable in dumbbell-shaped and in budding three-part zygotes as early as 4 hours after setting up the mating mixture (Figure 2). Both the fluorescence of a mating mixture measured in a fluorescence reader and the number of fluorescent zygotes counted in a hemocytometer were found to be linearly correlated with the actual mating efficiency as determined by growth selection of zygotes. This system was thus suitable for quickly assessing mating efficiencies and was used thereafter to evaluate experimental conditions. GFP expression in newly formed zygotes. 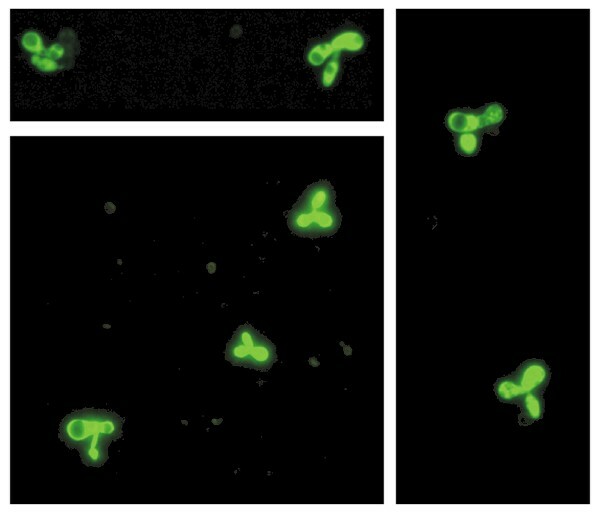 After mating of yeast strains PJ69-4A/pTS195.1 and YTS1/pCL1, cells were placed in a hemocytometer and subjected to fluorescence microscopic investigations using FITC filters (485/510 nm, excitation/emission). Dumbbell-shaped and tripartite budding zygotes of three independent experiments are shown. Apart from mating on filters, as in the standard mating procedure [23,28], other approaches have been described to yield optimal mating efficiencies and/or the maximum number of zygotes. These protocols aim at synchronizing the yeast cultures to maximize mating ability and/or enriching zygotes in the suspension by chemically induced cell arrest and zonal centrifugation [29,30]. Additionally, preincubation on specific media before mating has been shown to increase the mating competence of yeast cells [31,32,33,34,35]. We tested the applicability of these procedures to our frozen/thawed yeast cultures, as the use of frozen cells is one major benefit of the interaction-mating procedure with respect to library screening. GFP fluorescence in the resulting cell suspension was measured as a marker for zygote formation and improvements were confirmed by counting cells and propagating aliquots on SD-LU medium to calculated the exact mating efficiency. Neither enrichment of mating-competent cells by zonal centrifugation nor the use of chemically synchronized cells significantly improved mating efficiencies in our experimental set-up. However, preincubation of the two yeast strains in low pH medium before mating turned out to significantly increase mating efficiency. Preincubation of a mixture of a mid-log-phase culture of PJ69-4A/pTS195.1 and a melted aliquot of YTS1/pCL1 at high cell density (108 cells/ml) in YCM medium (pH 3.5) for 105 minutes, a subsequent washing step and incubation on a filter on agar plates (YCM, pH 4.5) for another 4.5 hours gave an average mating rate of 10%. An optimal cell ratio of freshly grown MAT a versus MATα cells of 1:1 has been reported for most mating protocols [32,36]. Because of freezing and thawing, however, the interaction-mating mixture is a heterogeneous cell suspension composed of viable and nonviable cells. Therefore, nonequivalent quantities of the two strains have been suggested to optimize mating . On the basis of the improved mating protocol described above, we systematically investigated the effects of cell ratio on mating efficiency. Varying amounts of freshly raised PJ69-4A/pTS195.1 cells from 0.1- to 25-fold excess over YTS1/pCL1 cells were tested. The ratio between the yeast strains (MAT a:MATα ratio) was calculated as the number of uracil prototrophic cells versus leucine prototrophic cells, thus representing the proportion of viable cells in the assay. Mating efficiency was assessed by the numbers of zygotes versus total cell number (including nonviable cells). Mating efficiencies were found to be strongly dependent on the MAT a:MATα ratio, showing an optimum at a ratio of 2.5:1, leading to a maximum mating efficiency of 17% (Figure 3). As a measure of mating competence of the frozen/thawed YTS1/pCL1 cells we calculated the ratio of zygotes versus viable leucine prototrophic cells. For optimal MAT a:MATα ratio of 2.5:1, up to 80% of the viable MATα cells have formed zygotes (Figure 3). This almost quantitative mating is of particular importance for the screening of cDNA libraries, where a complete coverage of the clones present in the library is necessary to ensure a nonbiased experimental set-up. Table 1 summarizes the results with respect to the number of cells needed to obtain 5 × 106 double transformants. Mating efficiency and mating competence is dependent on the ratio of the two yeast strains. Melted aliquots of YTS1/pCL1 were combined with varying numbers of freshly raised PJ69-4A/pTS195.1 cells and treated according to the protocol with preincubation at low pH and high cell density. Consistency of the final cell suspension was determined by propagating aliquots onto selective medium and counting cell numbers in a hemocytometer. Filled diamonds, mating competence, estimated as the percentage of zygotes per viable MATα cells. crosses, mating efficiency, estimated as the percentage of zygotes per total cell number. The efficiency of obtaining doubly transformed cells or zygotes, and the total cell number needed to gain 5 × 106 doubly transformed cells or zygotes are shown. The mating conditions found to be optimal for the model system were applied to the screening of a 'real' two-hybrid cDNA library of A. thaliana using a set of 'real' bait proteins. The cDNA library (> 106 independent clones) was transformed into Y187 (MATα), colonies were propagated, pooled and stored at -70°C. The fraction of viable cells in melted aliquots was determined as 39%. Twenty library screenings have been carried out using 15 proteins from A. thaliana and five proteins from Nicotiana tabacum as baits. The bait proteins included small Ras-like GTPases, kinases and several proteins of unknown function. The efficiency of the optimized mating protocol made it possible to set up a standard screening protocol with the potential to cover the expected bait-dependent variation in mating efficiencies. We used a mating mixture containing 6 × 108 cells in total, composed of 50% bait cells, 20% viable library cells and 30% nonviable cells, corresponding to a MAT a:MATα ratio of 2.5:1. Aliquots of the mated cells were propagated onto selective medium to determine mating efficiencies, and 108 cells were plated onto a single 500 cm2 agar plate to select for interacting clones promoting Leu/Trp/His prototrophic growth. The protocol allowed us to process up to 20 screenings in parallel with standard laboratory equipment. Mating efficiencies were bait dependent and ranged between 4.8% and 17.3%, indicating a general applicability of the method (Figure 4a). In only one case was our aim of 5 × 106 zygotes (corresponding to a mating efficiency of 5%, see above) not achieved. 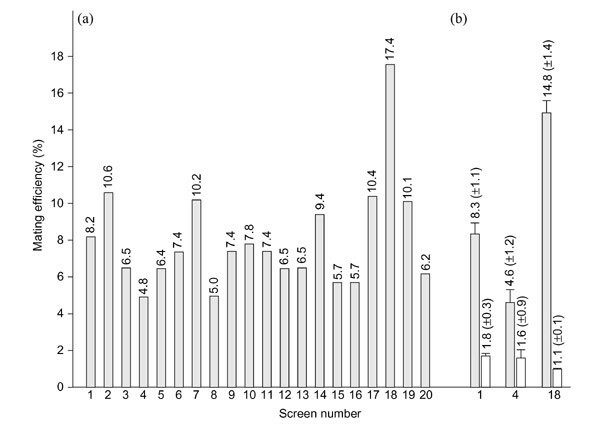 A direct comparison of the efficiency of the optimized protocol versus the standard protocol was done by repeating screenings 1, 4 and 18 using both protocols in parallel. Mating efficiencies using the optimized protocol were found to be greater by factors of 5, 3 and 13, respectively (Figure 4b). The optimized interaction-mating protocol for screening a cDNA library of A. thaliana. (a) Multi-parallel yeast two-hybrid screens were carried out using the optimized method with yeast cells preincubated at low pH and high cell density. Mating efficiency in terms of numbers of zygotes versus total cell number was determined for every single screening by propagating aliquots of the mating mixture on SD-LW medium and counting cells in a hemocytometer. (b) Comparison of library screenings using the optimized protocol (grey columns) or the standard protocol (white columns), respectively. Mean values of three parallel experiments are shown. The bait proteins were (followed by GenBank accession numbers): (1) Rho-like GTP-binding protein (G15V), AAC78242; (2) Rho-like GTP-binding protein (T20N), AAC78242; (3) Rac-like protein (G60V), AAB68394; (4) Rac-like protein (T65N), AAB68394; (5) Rac GTP-binding protein Arac10, AAC63014; (6) putative serine/threonine protein kinase, AAF27020; (7) putative protein kinase, AAD29828; (8) Pto kinase interactor-like protein, CAB89391; (9) receptor protein kinase, BAB01743; (10) nonphototropic hypocotyl 1-like, AAC27293; (11) nonphototropic hypocotyl 1, AAC01753; (12) N. tabacum nonphototropic hypocotyl 1-like_1a, unpublished; (13) N. tabacum nonphototropic hypocotyl 1-like_1b, unpublished; (14) N. tabacum nonphototropic hypocotyl 1-like_2, unpublished; (15) FH protein interacting protein FIP2, AAF14550; (16) N. tabacum FH protein interacting protein FIP2, unpublished; (17) N. tabacum jacalin-like protein, unpublished; (18) unknown protein, AAF13095; (19) unknown protein, BAA96996; (20) putative LEA (late embryogenesis abundant) protein, AAC23428. If not otherwise specified, proteins originate from A. thaliana. The mean mating efficiency of about 8% in these 20 experiments is somewhat lower than the optimal mating efficiencies using the model system, but is clearly sufficient to be used in the standardized screening protocol described, obviating the need to adjust conditions to every individual bait protein. The improved pretreatment and mating conditions prepare the cells optimally for mating, as can be seen by the fact that the experiment with the most efficient bait protein (Figure 4a, screen 18) resulted in almost quantitative mating; more than 85% of the viable library cells have formed zygotes. The main factor that determines the amount of material, costs and effort required to perform a yeast two-hybrid cDNA screening is the total number of yeast cells needed to obtain a sufficient number of double transformants expressing the respective fusion proteins. We have developed an optimized interaction-mating protocol with significantly increased mating efficiency which, because of the substantially reduced cell numbers, is applicable for large-scale two-hybrid screening. The protocol enabled us to set up a standardized screening procedure suitable for a wide variety of baits. This standard protocol is suitable for multi-parallel yeast two-hybrid screenings without the need for specialized laboratory equipment and at relatively low cost and effort. The method also offers the possibility of further development. The reduced volume enables the replacement of growth selection on agar plates in a two-hybrid screen by selection in liquid in standard microtiter plates (J.F. Uhrig, unpublished results). This could be the basis for automating this screening procedure to facilitate the high-throughput applications needed to analyze genome-wide protein interaction networks of higher eukaryotes. Yeast strains PJ69-4A  and Y187  were maintained using standard conditions . A MATα strain which is deleted in the URA3 gene was obtained by streaking out an overnight culture of Y187 onto YPAD medium containing 0.05% 5-fluoroorotic acid (TRC, Canada). Several colonies were picked and examined for uracil auxotrophy while maintaining the other markers of yeast strain Y187. The resulting yeast strain with the desired genomic markers was called YTS1 (MATα, ura3-52, his3-200, ade2-101, trp1-901, leu2-3, 112, gal4Δ, met, gal80Δ). Plasmid pCL1  encodes the full-length, wild-type Gal4 protein under control of the ADH promoter and was obtained from Clontech. Vector pTS195.1 provides the yeast-enhanced green fluorescent protein (yEGFP , GenBank accession number U73901) under control of the GAL1 promoter and was cloned as follows: yEGFP was amplified by PCR using primers YGFP-1 (5'-GAGAGAAAGCTTGGATCCATGTCTAAAGGTGAAGAAT-TATTC-3') and YGFP-1 reverse (5'-GAGAGACTCGAGAA-TTCTTATTTGTACAATTCATCCATAC-3') and cloned as a HindIII/XhoI fragment into vector pCUG1, a derivative of pRS316 (GenBank U03442) containing an EcoRI/HindIII fragment from pBM272 (GenBank U03497) carrying the GAL1/GAL10 promoter. Plasmid pCUG1 is a gift from Philip James (University of Wisconsin, Madison, USA). The construct pCUG1-yEGFP was cut with KpnI and XbaI and the fragment containing the GAL1/GAL10 promoter and yEGFP was ligated into the same sites of plasmid YEplac195 (; GenBank X75459) to obtain pTS195.1. Yeast full media and selective drop-out media were prepared using standard recipes . Transformation of plasmid or library DNA into yeast was done according to the LiAc transformation method [22,41]. Yeast strain YTS1 transformed with pCL1 was raised in liquid medium lacking leucine (SD-L medium) and was frozen in aliquots as a 25% glycerol stock at -70°C. For mating, a melted aliquot of approximately 7 × 107 cells was pooled with a threefold excess of a freshly raised culture of PJ69-4A propagating pTS195.1. This mixture was distributed onto a YPAD plate (140 mm diameter) and set on 30°C for 4.5 h. Cells were washed off the plate with 1 M sorbitol, sonicated, counted in a hemocytometer (Fuchs-Rosenthal-chamber) and titrated onto the appropriate drop-out media. GFP fluorescence was investigated by fluorescence microscopy using fluorescein isothiocyanate (FITC) filters (485/510 nm, excitation/emission) and by fluorescence measurements in microtiter plates (Dynatech Microfluor) using a Fluoroscan II fluorescence reader (Labsystems Oy, Helsinki, Finland; excitation 485 nm, half-width 14 nm, transmission > 50%; emission 510 nm, half-width 11 nm, transmission 40%). This protocol focused on stimulation of a/α-factor expression and optimized cell-cell contact during mating. The two yeast strains were mixed in the desired cell ratios, resuspended in YCM (1% yeast extract, 1% bactopeptone, 2% dextrose) at pH 3.5 and a cell density of 108 cells/ml and shaken for 105 min at 30°C. The cells were then diluted 1:100 in sterile water and cell clumps were resolved by sonification. The cells were then treated as follows. Diluted cells (45 ml) were spotted onto a 25 mm membrane filter (0.45 μm; Sartorius/PALL Gelman Lab) using a filter funnel with an effective filtration area of 2.5 cm2, resulting in a cell density of 1.8 × 107 cells/cm2. The membrane was transferred to an agar plate (YCM, pH 4.5) and incubated for 4.5 h at 30°C. The filters were placed in a 50 ml Falcon tube, superposed with 1 M sorbitol and cells were dispersed by 3-4 short intervals of sonification. Cells were collected by centrifugation, resuspended in an appropriate volume and aliquots were then propagated on selective medium. 236 ml of the diluted mixture of the two strains (corresponding to 2.36 × 108 cells, see above) were transferred onto a 47 mm membrane filter (0.45 μm; PALL Gelman Lab.) using a 500 ml filter funnel (PALL Gelman Lab. ; effective filtration area: 13.1 cm2) and incubated for 4.5 h at 30°C on YCM (pH 4.5) solid medium. After cells had been collected and resolved by sonification, the cell titer was determined. 108 cells were spread onto one 500 cm2 plate (Genetix) with selective media lacking leucine, tryptophan and histidine and supplemented with 3 mM 3-AT (SD-LWH3 medium) and incubated up to 7 days at 30°C. For screening cDNA libraries, yeast strain Y187 was transformed with the activation domain fused cDNA library from A. thaliana in plasmid pACT2 , plated onto SD-L medium and incubated for 2-3 days. Colonies were collected from the plates using 1 M sorbitol, pooled, sonicated and stored in aliquots after addition of 1 vol 50% glycerol. A thawed aliquot was propagated on SD-L medium and cells counted in a hemocytometer to determine the survival rate of leucine prototrophic cells. We are grateful to F. Salamini (MPI Cologne, Germany) for his support and Manfred Kögl (LION Biosciences, Heidelberg, Germany) for helpful discussions. Arthur Molendijk (MPI Cologne, Germany) provided the genes for AtROP4 and AtRacE, and Brendan Cormack (Johns Hopkins University, Baltimore, USA) donated the gene for yEGFP. Plasmid pCUG1 was obtained from Philip James (University of Wisconsin, Madison, USA) and the Gal4 activation domain fused cDNA library of A. thaliana is a gift from Klaus Salchert and Csaba Koncz (MPI Cologne, Germany). The yeast two-hybrid screen using LEA as a bait (screen number 20) was carried out by Ilona Zimmermann during her PhD studies in our lab. This work was supported by the Bundesministerium für Wirtschaft und Technologie (BMWi).